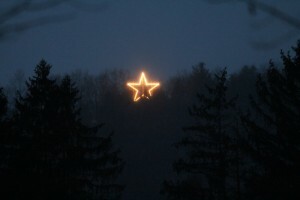 When the days shorten and the nights grow long, we bring light to our evenings with the star atop Mt. Tom. It’s a little thing, really, but it adds a certain charm to our community during the nights of winter. You can see it as you drive into Woodstock, from the green, and many of us gaze upon it from the windows of our village homes. A beacon. A harbinger of the season. A Woodstock tradition. Locals know that Woodstock is a fabulous place to spend the winter, and The Boston Globe couldn’t agree more! Check out Eight Ways to have Fun in Woodstock Vermont – a great feature on some of our favorite local businesses, makers, and eateries. Here’s to a long winter. The days are crisp and bright; the nights require a sweater. Summer burns into reds, oranges, and yellows, heralding the arrival of a new season. If you haven’t visited Woodstock this summer, it’s the perfect time for a quick trip – you’ll beat the foliage crowds and get a preview of the autumn to come. 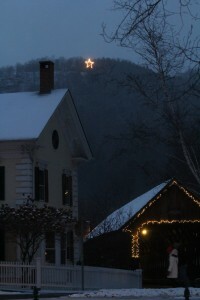 Visit Woodstock’s Chamber of Commerce website to stay abreast of seasonal events and activities. One wonderful reason to visit Woodstock in the spring is the chance to see the village’s thousands of lilac trees in full bloom. But hurry! 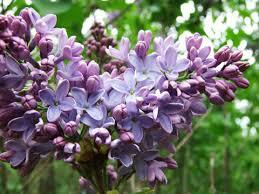 No plant better captures the evanescence of a hard-earned New England spring than the lilac. A member of the olive family, lilacs are popularly grown in temperate areas from southeastern Europe to eastern Asia (though we can’t help feeling a proprietary affection for our local beauties). While the most common hue is the light purple from which the popular name is derived, blossoms can be found in white, pink, pale yellow, deep purple, dark burgundy, and variegated varieties. 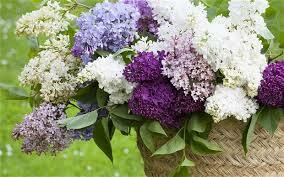 The flowers are appealing for their luxuriant shape and saturated colors, but it’s the heady fragrance perfuming our little village for a week or two that makes lilacs the quintessential harbinger of springtime in Vermont. 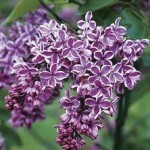 Be sure to visit our Pinterest page to gather ideas for growing or displaying your own lilacs. 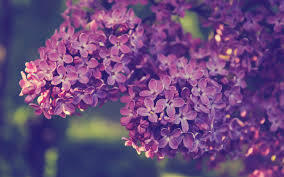 And follow us on Instagram to see images of our local lilacs in bloom! When the days grow warmer but the nights stay cold, Vermonters know that it’s time to start tapping maple trees. From home connoisseurs who only hang a few buckets to major producers who harvest from a vast sugarbush, nearly every Vermonter looks forward to collecting, drinking, and boiling the maple sap (or maybe we’re all just excited about spring). Vermont produces over 42% of the nation’s maple syrup, and over 1,500 sugarhouses contribute to our state’s bounty. Of course, we all know that maple syrup makes a delicious topping for pancakes, waffles, oatmeal, and ice cream, but it’s also a versatile ingredient for more savory dishes. 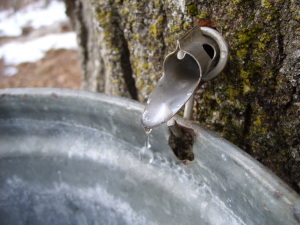 For a refreshing springtime beverage, the sap itself can be drunk straight from the tree, or it can be mixed to create an artisanal cocktail. Visit our Pinterest page for great maple syrup ideas. However you decide to enjoy your maple, it’s a great time of year to visit Vermont and participate in our favorite spring ritual. Water…Abundant, flowing water covers the Earth. Water…A simple combination of 2 parts hydrogen and 1 part oxygen unified in an explosive cauldron billions of year ago. Rare in the universe and irreplaceable in our time. Water…The life-giving liquid defines our world blue and shimmering in the vast expanse of space. Water….Three days give or take a few hours is as long we can last without the fluid that comprises over 2/3 of our bodies. Water…Rain, rain go away. A rhyme unsung in the parched west at the edge of the Pacific. Water…water, water everywhere and not a drop to drink. Water… We take it for granted in Vermont, until it seeps into our basements. Water…It is everywhere….until it isn’t. Here is a short video on how wonderful the water of Vermont is. We have an abundance of water and blessed with this abundance. 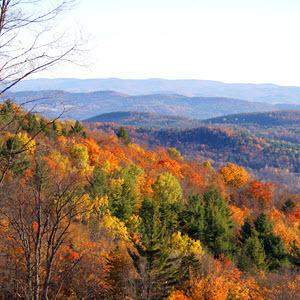 The water of Vermont also helps to support real estate values. It makes for many beautiful scenes and fun to play in. Want a Beer? Bring your Water Shoes! Beer lovers in the greater Woodstock area know that one of the best summertime beer experiences can be found at the Long Trail Brewing Co. in Bridgewater Corners. A river runs through it! (Almost & I’m not referring to Irene) There aren’t many breweries that have a river for walking, sitting, or (why not) lying in whilst sipping craft beer. On a hot summer day, there’s nothing better. The Long Trail Brewery Co. is fashioned after the Hofbrauhaus in Munich (one of the most famous of the Munich beer halls), so it’s not your average American tavern. They close early and have created an atmosphere that lends well to family gatherings and comfortable socializing. Long tables encourage group seating and there is no large screen television to stare at so you soon find yourself chatting with your neighbor. After you’ve enjoyed reviving the art of conversation, over well-prepared pub fare, and refreshed your soul by soaking your feet in the Ottauquechee River, you can meander through a self-guided tour of the brewery to check out the spotless, hi-tech brew-house and cellars. I like to spend a little time gazing down on the bottle spinner, dazzled and a little dizzy from watching the rapid-fire shuffle of bottles as they spin upside down, round and round, on their journey through the filling and capping machine. 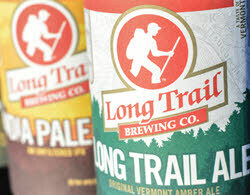 For those of you who don’t know the story, Long Trail Brewery Co. (originally Mountain Brewers) began production in 1989 as a 15-barrel brew-house in the basement of the Old Woolen Mill just east of their current site. At the time, malt beverage options in the States consisted of mass-produced beers like Budweiser, Miller, and Coors. Imported (and expensive) beers from Holland, Germany and elsewhere in Europe bore little resemblance to the classic brews more well-traveled Americans enjoyed on the continent. Irish pubs all offered their own basement-brewed ale or lager along with the ubiquitous Guinness on draught. Here, in the US, it was a bleak landscape for the thirsty palate of beer connoisseurs. Andy Pherson decided that there was no reason why American’s couldn’t make high-quality beer at an affordable price, so he started production of one of the first American craft beers. A risky and rare venture at the time is now approaching a significant anniversary. The Long Trail Brewing Co. has been in business for 25 years and now distributes their brew all along the eastern coast. Vermont has become a mecca for newly converted acolytes of the craft brewing art, which is nearly a religious calling for some. Maybe cooler than the actual place is the mission of Long Trail Brewing Co. The words on their website indicate a commitment to the environment, community, and healthy lifestyles, but you can read that on just about any website these days. If you Google Long Trail Brewery Co., you’ll find videos and articles about their success with water conservation and their investment in ‘cow power’ (converting methane to energy). You may find out that they have built their own wastewater plant, they source as many ingredients as possible from local vendors, and they have even made a pact to sell only merchandise that was made in the US of A (not as easy as they’d hoped but they’re halfway there). Long Trail Brewing Co. is just one of those places that is always looking for a new way to reduce impact and produce a product that is out of this world. If you haven’t already, I suggest you taste it in this world, preferably with your feet chilling in the river.